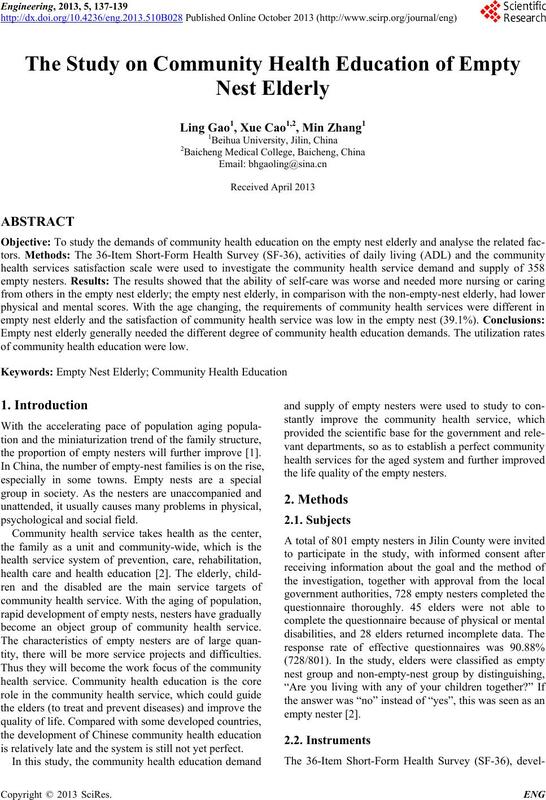 of community health education were low. the proportion of empty nesters will further improve . psychologic al and social field. become an object group of community health service. tity, there will be more service projects and difficulties. is relatively late and the system is still not yet perfect. the life quality of the empty nesters. ability of daily life . 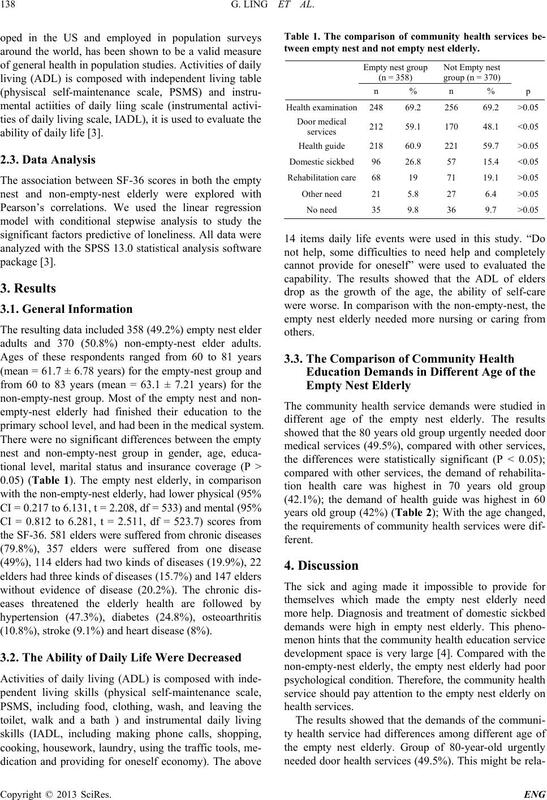 adults and 370 (50.8%) non-empty-nest elder adults. primary school level, and had been in the medical system. (10.8%), stroke (9.1%) and heart disease (8%). tween empty nest and not empty nest elderly . services between different age empty nest elderly. difference to other services (P < 0.05). nearby. They were lack of family chap erone in sick times. So the demand of door medical services is more urgent. ledge and have strong health concept and self-health care. 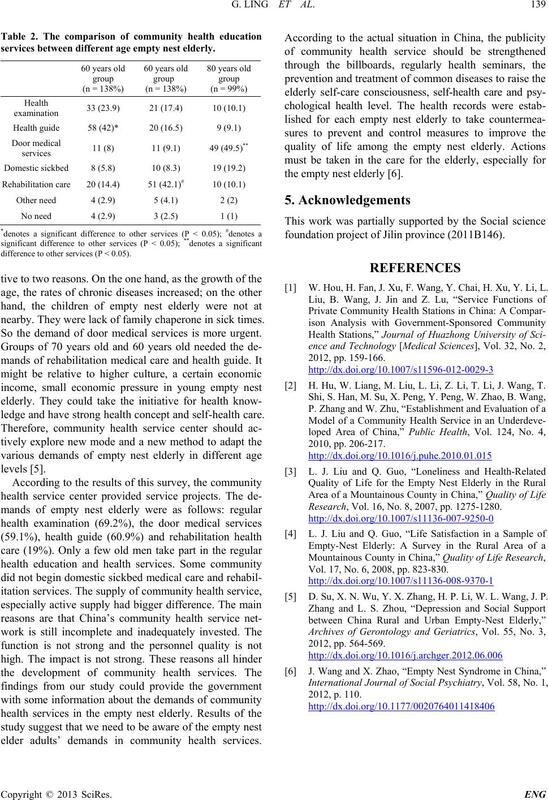 elder adults’ demands in community health services. the empty nest elderly . foundation project of Jilin province (2011B146). W. Hou, H. Fan, J. Xu, F. Wang, Y. Chai, H. Xu, Y. Li, L.
 H. Hu, W. Liang, M. Liu, L. Li, Z. Li, T. Li, J. Wang, T.
Research, Vol. 16, No. 8, 2007, pp. 1275-1280. Vol. 17, No. 6, 2008, pp. 823-830. D. Su, X. N. Wu, Y. X. Zhang, H. P. Li, W. L. Wang, J. P.